As early as next week, the House may vote on an Iran War resolution, H. CON. RES. 362, titled, "Expressing the sense of Congress regarding the threat posed to international peace, stability in the Middle East, and the vital national security interests of the United States by Iran's pursuit of nuclear weapons and regional hegemony, and for other purposes." Now, I remembering hearing that the NIE re Iran's nuclear program pretty much made plain that there was NO threat from Iran on a nuclear level. So what is the truth here? We judge with moderate confidence that the earliest possible date Iran would be technically capable of producing enough HEU for a weapon is late 2009, but that this is very unlikely. The statement in the resolution is not technically a lie, but it completely misrepresents the NIE statement. Isn't there one mainstream journalist curious enough to look inside a resolution to find out what it actually says? It's not even a long one. And the NIE is only 9 pages, five of which are intro re NIEs. Seriously. What has happened to journalism in this country? The thought of this makes me sick to my stomach. And yet, we've been hearing rumblings re this for years, from people in a position to know. Israel has been making concessions to Hamas, Hesbollah, and Syria while rattling its air force saber at Iran. No one can seriously believe that Iran will stop enriching Uranium, which is their legal right under the Treaty on the Non-Proliferation of Nuclear Weapons (NPT). Iran does not believe that Israel will attack, but is ready to retaliate. Israel is not been know to bluff. Many of its leaders have called for strikes on Iran. Taken together, it is obvious that Israel is trying to not only isolate Iran, but prevent attacks from its other enemies when it attacks Iran. Dictator George W. Bush has said and his handler Cheney has stated on numerous occasions that THEY will not allow Iran to acquire nuclear weapons. Billy Kristol, a conservative publication editor, has said Bush might bomb Iran if he “Thinks Senator Obama’s Going To Win”. It now seems that Obama will win since he leads Bomb-Bomb McCain by 15 points, a 42% lead. The polls do not reflect Bob Barr who could take another 4% from McCain, extending Obama’s lead to 51% to 32%, or a 59% lead, too great to fake with the controlled voting machines. Gold traders believe that “What lies ahead in this radically changing environment? In our view, the primary news changing event is the forthcoming attack by Israel on Iran. Our European friends have been predicting this for months and we chose to think it might not happen. Now we are about 80-90% certain it will. This event, if it becomes true, will drive energy and precious metals prices to the moon. On the other hand, stock markets could severely crash. The disruptions in global banking and credit markets might receive immeasurable damage; perhaps some of it un-repairable. One analyst says it’s a partial ploy to keep [President] Bush in office after January based upon the War Powers Emergency Act." The US has been stepping up the pressure on Turkey to support war with Iran. The former German foreign minister has stated that the US will attack Iran. The Asia times says that Bush will strike by August. There are many, many more articles supporting this. Taken all together, it seems very likely that an attack on Iran is imminent, started by Israel, followed by retaliation on the US and Israel by Iran, followed by a complete destruction of Iran’s infrastructure retaliation by the US air force – followed by a ground war, involving many nations. FISA: Obama's fault, or ours? While Obama says he'll "try" to remove the immunity provisions for the telephone companies who provided the government illegal access to our phone calls, emails, and other electronic communications, others say he should focus on the other provisions of the bill, which take away our right to privacy. They want Obama's head on a platter. And if they're not careful, they're going to get it. People who do what we are asking of Obama have been killed. Over and over. Those who did the noble, right thing, who challenged big money head on, who protested war and took steps to end it, have paid a heavy price. President John Kennedy. Senator Bob Kennedy. Martin Luther King. Obama is not naive. He knows what the stakes are. A part of me is mad at him for not trying harder, but another part is hearing him say to himself, "but when I'm president, things will be different." I'd argue the voice in his head is wrong. Because it's what you do in a crisis that defines who you are. And our country is facing a constitutional crisis. We need giants, but have only some men and women on the hill, more interested in protecting their own careers than in fighting the epic battle that needs to be waged. But I also feel sorry for him. He aspires to be someone great. But so far, he is only a man, not a giant. Obama can't do this alone. We need to help. And so far, most people not on liberal blogs aren't even aware of this battle. And even some who ARE aware think immunity is okay. We feel we are the core of the party, but we are not. There are many in the party who believe that immunity IS the right thing. I am not of that persuasion. I sometimes wonder if we're just going to have to go through fascism to truly understand it's danger, the insidiousness of it all. Will we have to suffer a holocaust of our own - not Jews, this time, but perhaps liberals, or maybe Muslims - to understand why we can't give away our rights in this fashion? Ask a German. They have incredibly strict laws (or had, prior to the EU) preventing the collection of personal data because THEY KNOW how dangerous the accumulation of such data can be. This is OUR fight. This has ALWAYS been OUR fight. Over and over, whenever the government has overstepped, WE have failed to reign it in. When Nixon overstepped, he was forced from office. But when the CIA overstepped, performing illegal domestic activities - spying on Americans right here at home, infiltrating student groups and peace movements - Congress failed to serve up an appropriate remedy. Cowed by the death of a CIA station chief they claimed had been exposed by the incessant prying atmosphere (when they weren't prying nearly hard enough), Frank Church, perhaps due to his own presidential ambitions, refused to push for accountability, and allowed the laws to be opened up, to give the CIA greater leeway to commit what previously had been an egregious breach of the law. WE failed by not protesting this in the streets, by rolling over and going back to sleep. By pretending that didn't mean anything. It set a dangerous precedent. During Iran-Contra, when Robert Parry made the cover of Newsweek with an article that demonstrated how Reagan's aids were rewriting chronologies to hide his hand in the deal, did Congress rise up and impeach Reagan? No. Newsweek pulled that issue from the stands! As the title of a wonderful little play cries, everything was "in the hands of its enemy." What did WE do? Nothing. There was no outrage, outside a few tiny groups of people paying attention. I submit WE have not done OUR part. How many of us have pressed for the truth about the deaths of those who WERE brave, who DID stand up against huge forces and do battle? WE didn't have their back. WE didn't do our part. So we can rant and rave all we want. But WE are a big part of the problem. I'm trying to do my part. I've done a lot of homework. I've been very vocal about who I think the killed our best leaders and why. I speak out loudly and often on the subject because I believe doing so helps protect future leaders. But it will take much more than a handful of researchers. It will take an entire country saying no more lies. No more unelected goverment. No more domestic spying. No more cover-ups for political assassinations. If the price may be an assassination for which no one will be held accountable, is it too much to ask Obama to do the right thing? Do WE have his back? Are we truly going to take to the streets and hold our elected leaders accountable? No one else will do it. This is still a government of the people, and by the people, if not often FOR the people. And WE have shirked our duties. This is on us as much as him. Because so long as we're only talking to each other, we're not changing things. We need to spend more time talking to people who AREN'T on left-wing blogs. Reaching NEW audiences. Commenting on sites where right-wing libertarian-type allies may see it. 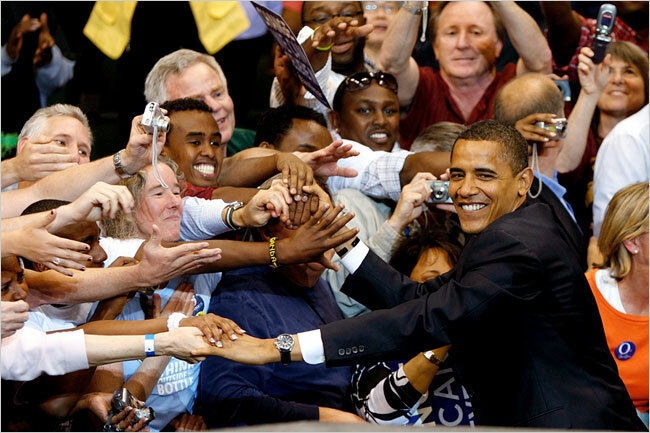 Then we may build enough awareness to truly have Obama's back, and the back of anyone trying to do good. I was sorry to see all the vitriol re Ron Paul. He wasn't going to win, so his more extreme views didn't bother me. Those weren't the reasons people were supporting him. They supported him because he said government is corrupt and broken, and that we shouldn't be at war in Iraq. And he was dead on re the need to reform our money system. When we shut our ears and go "La-la-la can't HEAR you because you're a Republican/Democrat," we're missing some chances to build bridges and forge powerful coalitions. We need to listen to the arguments of others, if only to better refute them. But we should listen with an ear to learning, and perhaps reaching a point of agreement in a surprising place. And we need to teach each other history, and specifically, conspiratorial history. Conspiracy theory is simply pattern recognition. But you can't recognize the patterns if you don't know what they look like. The only way to prevent a conspiracy from happening is to expose it before it happens. The only way to expose it is to recognize the signs. And the only way to recognize the signs is to study conspiracies. We can't prevent large-scale corruption until we gain some conspiracy literacy. I believe strongly the many voices crying out re Iran have prevented us, so far, from creating a fake event that would drag us into war. By not being willing to deal with the weirdnesses around 9/11, we have shirked our duty. Many don't want to be associated with a few truly paranoid people who surround that case, but there are deeper issues that have nothing to do with planes and buildings that we should be pursuing, specifically, where did the money come from to pay the hijackers? It went from the ISI, the CIA-trained intelligence service in Pakistan, to the hijackers. Who gave the money to ISI? And isn't that worth finding out? If we shriek "conspiracy lunacy" every time the subject comes up, we can't find out. And if we can't find out, we can't prevent future attacks. So yeah, we can claim to be holier than thou - but really, what are WE doing? How can Obama or anyone stand up to such enormous power when the costs to his predecessors have been so very high? The only way he'd dare is if we bring him right up to the goal line. Re illegal wiretapping, this IS a big deal. This is THE big deal of our collective rights, so far. And those who get it are working hard on this. Many more don't have a clue. And it's going to take so many more to win this one. It's going to take something more along the lines of a general strike to shake the business community to its knees. And that's the positive option. The negative option is that we have to suffer a period similar to that in Nazi Germany to wake people up, to make them realize politics is as important as life itself. Most people in America find politics boring, something removed, something they don't have to participate in. But most people in Germany of my generation and earlier understand that not paying attention can have truly disastrous results. So stop whining about Obama. Press him. Support him. Push him to do the right thing. But understand as well that he's all we've got. No one else is coming. take a look at yourself and make a change. I woke up and was immediately disgusted by watching my so-called President shill for the oil industry again today. He's telling Congress to open up the Alaskan National Wildlife Refuge again - ANWR. Do you know how much -- or rather, how little -- oil there is in ANWR? According to this MSNBC article, 10.4 billion barrels. That sounds like a lot, until you realize how much oil Americans consume. According to NationMaster.com, we consume approximately 20,730,000 barrels of oil A DAY. Multiply that by 365 days and we consume about 7,566,450,000 a year. So how long would ANWR last us if we used it for our sole oil source? Just a little over ONE YEAR. Outrageous. We'd destroy an ecosystem that is hundreds of thousands of years old for a little more than ONE YEAR's worth of oil? Absolute insanity. Of course, we won't even get that oil all at once. It will only be a trickle until it reaches maturity. So that 1.4 year's worth of oil will be spread out over other years, hardly reducing our reliance on foreign oil, and hardly putting a dent in the price. So why is Bush pushing this? Because he's about to leave office, and his oil buddies want to grab all the oil they can while they can. Because they know an Obama administration would not sacrifice this land and its animals to the greed of a few. The same holds true re our offshore oil supplies. We'd be willing to risk polluting entire beach communities for those insanely small droplets, relative to our vast need, and we'd be doing it to feather the pockets of private investors. No. Just say no. This is insane. What we need is a comprehensive energy policy that invests money in renewable energy sources -- wind power, solar, geothermal, and others -- and if I were President, I'd insist that any investments in research by government be repaid in royalties once the private businesses starting showing a profit. No one should be allowed private profit from these basic necessities. I don't put food there because there are many sources of food, and so many options. But basic nutrition is, in my opinion, a healthcare issue, and no one should be denied basic nutrition, even if they are homeless. No one should be allowed to starve who is born in America. It's unconscionable. Call your congressional representative and Senate members at any of these toll-free numbers below. If you don't know who your senators are, go to the Senate Web site and look them up. If you don't know who your congressional representative is, go to the House Web site. Then call. It takes less than 30 seconds. Just say "I oppose offshore drilling and drilling in Alaska. Please support renewable energy proposals instead." Call any of these and ask to be transferred to the appropriate office. Your children and their offspring will be forever grateful. This time, may the dream become the reality. I'd tell you how truly happy I am that Obama won, but I'm busy preparing for my COPA presentation. One note on my previous post. Howard Hughes was not "the Hughes organization." Read between the lines. More later. John Meier, former advisor to the recluse billionaire industrialist Howard Hughes, claims that the Hughes organization was involved in the assassination of Robert Kennedy in 1968. Among Mr. Meier’s acquaintances were members of the Nixon family, Vice President Hubert Humphrey, Robert F. Kennedy, Los Angeles Mayor Sam Yorty, Head of the F.B.I. J. Edgar Hoover, Paul Schrade (who also was shot at the Ambassador Hotel in Los Angeles along with Robert Kennedy), Harry Evans (who was six feet away from Kennedy when he got shot) and numerous others that are pertinent to this subject. Mr. Meier had been introduced to Sirhan Sirhan’s lawyer, Mr. Lawrence Teeter, by Paul Schrade in 2005. Mr. Meier had numerous telephone conversations, e-mail exchanges, and meetings in Los Angeles with Mr. Teeter regarding Robert Kennedy’s assassination. The meetings that occurred during the week of February 13th - 19th 2005 in Beverly Hills, California, were recorded by Mr. Teeter. During that time Mr. Meier was also in communication with Paul Schrade and his wife. Mr. Meier claims that Mr. Teeter was preparing for a new trial for Sirhan Sirhan based on the new evidence that they had put together. Mr. Teeter died in Conchitas, Mexico on July 31, 2005. Mr. Meier had his lawyer, Mr. Dale Pope get in touch with the State Bar of California, in order to retrieve all the documents, tape recordings, and e-mails that were in the hands of Mr. Teeter pertaining to Mr. Meier. After getting no satisfaction from the State bar of California, Mr. Meier had been informed by a contact that a burglary took place at Mr. Teeter’s home. Mr. Pope then was told by Mr. John Fulton from the State Bar of California that there was indeed a theft of records from Mr. Teeter’s home. Mr. Meier has not been given back any of the items that he requested. Mr. Meier is now preparing to release the information that he has in regard to the Robert Kennedy assassination. Go to www.johnhmeier.com for more information on Mr. John Meier and the harassment by the U.S. Government on Mr. Meier and his family. You can watch a video of Meier saying the above at his site. Click the RFK link. I met John Meier years ago, before I started my own deep journey into this case. Meier worked for Hughes during the era when Robert Maheu, the CIA's handpicked man to plot Castro's assassination, was running the Howard Hughes organization. CIA money flowed freely through the Hughes organization, finding its way to political candidates that included Gerald Ford, the Warren Commission member who would eventually become President. I had gone to talk to him about Howard Hughes, about whom I was much interested. On the way to see him, I called Meier to check in. He told me he had just gotten a call from Robert Maheu, asking, hey John, how are you doing. Is there anything you need? Meier thought that was bizarre, since they hadn't talked in ten years. I thought it was more than sinister that the very day I was on my way to see Meier he would hear from Maheu. Meier showed me his city, his home, his children, and talked to me of some general data re his murder charge, which was eventually proven false. (See the book Age of Secrets for the full account of that horrific saga.) Meier told me near the end of our conversation that he and J. Edgar Hoover had discussed the RFK assassination at one point, and that Hoover had told him, look, we know this was a Maheu job, but I'm powerless against the CIA. At the time, that statement rang true to me based on the research I had done to date. In the years since, I continue to be persuaded that there may be much truth to that statement. For years I've been hoping Meier would tell what else he knew about the case. Today, he started, by releasing this statement, which I understand is simply the tip of the iceberg. I am not passing judgment on the veracity of his information until more of it is known. For now, I'm simply sharing this provocative statement and waiting for the proverbial other shoe to drop. I may yet have reason to rebut all of this. But I need to see more data first.